Normal 0 false false false MicrosoftInternetExplorer4 Fully updated for Windows 8 support, .NET 4.5, and Windows Phone development, this is the most comprehensive, practical reference to modern programming with Visual Basic 2012. 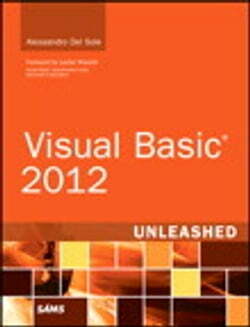 Written by Visual Basic MVP Alessandro Del Sole, a long-time leader of... read more the global VB community, this book illuminates the core of the VB language and demonstrates its effective use in many current programming scenarios. Del Sole covers both Visual Basic 2012 Professional Edition for professional developers and the Express Edition for hobbyists, novices, and students. Writing for VB programmers at all levels of experience, he walks through using VB 2012 for data access, Windows desktop/Windows Phone user interface development, networking, communication, and much more. For those moving from structured languages--including VB 6--Del Sole offers detailed guidance on building effective object-oriented code. He also demonstrates how to make the most of Microsoft's updated .NET 4.5 platform to write more robust and powerful software. Detailed information on how to... Understand the Visual Studio 2012 IDE, .NET Framework 4.5, and the anatomy of a VB 2012 application Debug VB applications and implement error handling and exceptions Build efficient object-oriented software with classes, objects, namespaces, and inheritance Work with advanced object-oriented features, including interfaces, generics, delegates, events, and collections Access data with LINQ--including LINQ to Objects, SQL, DataSets, Entities, XML, and Parallel LINQ Build modern Windows applications with WPF Develop web-centric applications using ASP.NET, Silverlight 5, and Windows Azure Services cloud computing Use advanced .NET 4.5 platform capabilities, including asynchronous programming, multithreading, parallel programming Build apps for Windows Phone Test code with unit tests, TDD, and code contracts Deploy apps efficiently with InstallShield for Visual Studio and ClickOnce "